Flint, Michigan is this year’s face of the infrastructure problem: Flint’s (and many other cities’) outdated water systems are literally poisoning people. All around us we see bridges and roads that are in (really) bad shape, aging and failing rail transit systems, traffic jams everywhere, power outages – problem after problem. Our country’s infrastructure is in bad shape and rapidly getting worse. But we can’t get our own government to spend the necessary money to fix the problem. That’s just maintenance, never mind modernization to a 21st-century infrastructure to drive the economy, with such features as high-speed rail, modern city rapid-transit systems, “smart grid” electrical systems transmitting renewable energy, fiber-optic internet. But at CAF every week is infrastructure week because we have been on our soapbox shouting to the rafters about this for quite some time. To help kick off the week, The Hill looks at “Five big infrastructure emergencies,” The Brent Spence Bridge connecting Cincinnati and Covington, Ky., Washington D.C.’s Metrorail system, the Gateway Rail Tunnel project between New Jersey and Penn Station in New York City, the I-10 Bridge in Southwest Alabama over the Mobile River and the San Francisquito Creek bridges in Palo Alto, California. These are representative of the hundreds, if not thousands, of infrastructure emergencies nationwide, but are hardly the worst examples. That is the money that the American Society of Civil Engineers this week said in its latest “Failure to Act” report that each U.S. household is losing “each year in disposable income due to infrastructure deficiencies.” Seen another way, each family pays a $3,400 annual tax for what federal, state and local governments don’t spend to properly maintain and expand our transportation, water and electricity networks. 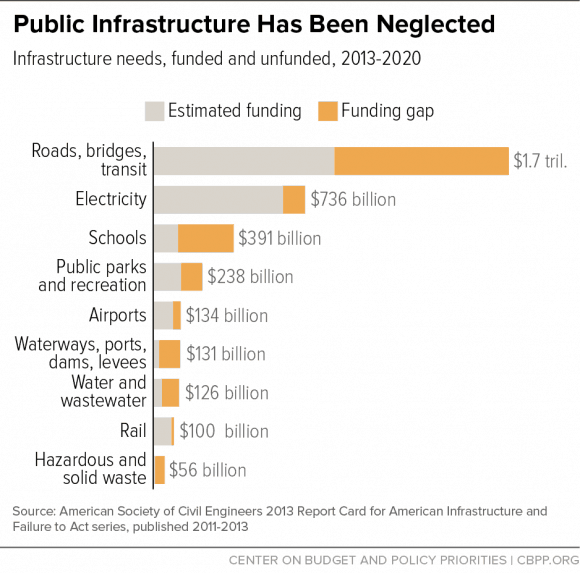 Not adequately investing in infrastructure is costing the economy more than three times more than what it would cost to bring these systems up to a state of good repair. … what we should be spending between now and 2025 would take about $1.4 trillion, the ASCE says. The cost of not spending that money, according to the ASCE? Almost $4 trillion. With that loss comes the loss of 2.5 million jobs. … According to the report, more than 40 percent of buses and 25 percent of rail cars are in marginal or poor condition. Ironically, Trump’s own proposals to cut taxes guarantee that if elected he cannot meet his promise to spend on infrastructure. But he is not alone in this. Since then, the Republican Party is ideologically locked into anti-tax, anti-spending and general anti-government policies. The kook right (perhaps that should read “Koch right”) that really “leads the charge” for Republicans these days says “Infrastructure Spending Is Not the Federal Government’s Business” or that infrastructure spending is just more “big government.” Heritage Foundation claims here that government spending on infrastructure “takes money out of the economy.” Some of the (Koch-funded) kooks even actually claim that investing in infrastructure hurts the economy. The Chamber of Commerce is one of the leaders of Infrastructure Week, asking Congress to approve increases in spending on maintaining and modernizing our infrastructure. But the Chamber has helped elect the Tea Party Republican majority that pushes for tax cut after tax cut, and which opposes this spending and wants to send the responsibility back to the states. And many of the companies belonging to many of the organizations sponsoring Infrastructure Week, like the Chamber, themselves dodge paying the taxes that could fund infrastructure projects. So how do you increase demand in an economy? With jobs that pay well. How do you get jobs to pay well? … [M]ake sure there are plenty of jobs. When there are so many open jobs in an economy that employers start having trouble finding people to work for them, they start to offer better pay. ● The country desperately needs to repair and modernize infrastructure. ● Interest rates are extremely low. The markets are practically demanding that the government issue bonds, and these bonds can pay for the needed infrastructure work. ● Repairing and modernizing infrastructure pays for itself by making the economy more efficient, thereby boosting economic growth. ● Infrastructure work hires people and boosts suppliers, boosting the economy even before these efficiencies take hold. Let’s do the work that needs to be done. Take a look at Infrastructure Week. On Twitter, take a look at the hashtag #InfrastructureMatters.